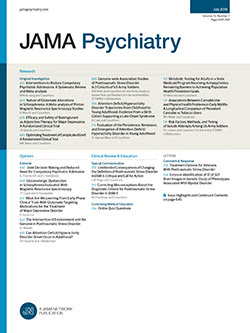 Fusar-Poli et alArticle conducted the first meta-analysis, to their knowledge, of the risk of psychosis transition in about 2500 individuals at clinical high risk for the illness. They found a consistent transition risk of 18% after 6 months of follow-up, 22% after 1 year, 29% after 2 years, and 36% after 3 years. The risk varied with patient age, the nature of the treatment provided, and the way the high-risk state was defined. Diwadkar et alArticle applied dynamic causal modeling to affective processing functional magnetic resonance imaging data collected in children and adolescents at increased risk for schizophrenia and controls. At-risk participants were characterized by reduced frontolimbic coupling and increased inhibition of frontolimbic pathways by affect. Reduced connectivity associated with schizophrenia may be a developmental marker of vulnerability in young subjects at increased risk for the illness. Freiheit et alArticle prospectively evaluated the cognitive functioning of 350 older patients with ischemic heart disease over 30 months postcardiac catheterization. Those with persistent depressive symptoms during the first year of follow-up showed significant declines in a variety of cognitive domains including attention/executive function, learning/memory, and verbal fluency. Webb et alArticle investigated suicide among primary care patients diagnosed with various major physical diseases in the United Kingdom compared with people with none of these illnesses.Effect sizes in women were greater than for men. In women with cancer and coronary heart disease, a significant elevation in risk persisted after adjustment for depression. Overall, heightened risk was confined to physically ill women younger than 50 years and older women with multiple physical diseases. Kopelowicz et alArticle randomly assigned 174 Mexican American adults with schizophrenia-spectrum disorders and their key relatives to a culturally adapted multifamily group therapy focused on improving medication adherence, standard multifamily group therapy, or treatment as usual. At posttreatment and 1-year follow-up, the culturally adapted multifamily group therapy subjects had better medication adherence and were hospitalized less often than subjects assigned to the other 2 groups. Weisz et alArticle tested the Modular Approach to Therapy for Children with Anxiety, Depression, or Conduct Problems (MATCH), a new integrative, modular treatment encompassing multiple psychiatric disorders. The randomized trial included 174 clinically referred 7- to 13-year-olds treated for anxiety, depression, and/or conduct problems. Youths receiving MATCH showed faster improvement and better clinical outcomes than (1) youths receiving standard evidence-based treatments and (2) youths receiving usual care. The flexibility and multidisorder focus of MATCH may make it a better fit to everyday clinical practice than separate single-disorder evidence-based treatments. Harenski et alArticle investigated sexually sadistic violent offenders and nonsadistic violent offenders using functional magnetic resonance imaging while viewing images of people in pain and rating pain severity. Sadists, relative to nonsadists, showed greater amygdala responses to pain pictures, higher pain severity ratings, and a positive correlation between pain ratings and hemodynamic activity in the anterior insula. Sartor et alArticle examined common genetic and environmental contributions to lifetime low-risk trauma exposure, high-risk trauma exposure, major depressive disorder (MDD), and posttraumatic stress disorder (PTSD) using a large young adult Australian sample of twins and their siblings. An extremely high degree of genetic overlap was observed between high-risk trauma exposure and both MDD (rg=0.89) and PTSD (rg=0.89). Genetic factors contributing to MDD and PTSD were perfectly correlated. Hartlage et alArticle examined daily ratings of perimenstrual symptoms and functioning in community and clinical samples. Results are informative for DSM-5. The most symptomatic period includes the few days before through the first 3 days of menses, not only the premenstrual phase. Depressed mood was less frequent than other affective symptoms. Four symptoms rather than 5 characterized women with premenstrual dysphoric disorder in the combined cohort. Diagnostic frameworks for pervasive developmental disorders (commonly called autism spectrum disorders [ASDs]) include subtypes such as autistic disorder, Asperger syndrome, and pervasive developmental disorder–not otherwise specified. In a multisite study of 2102 children, Lord et alArticle used standardized behavioral data to predict the application of these diagnoses by clinicians. Sites showed substantial variability, particularly for children with milder autistic symptoms, suggesting that ASD subtypes could be replaced by ASD severity accompanied by explicit recognition of features such as intellectual ability. Shulha et alArticle undertook genome-wide profiling of a histone methylation mark (H3-trimethyl-lysine 4), which is involved in epigenetic control of gene expression, in postmortem brains of 16 autism cases and 16 controls. When chromatin from prefrontal neurons was studied separately from the surrounding nonneuronal cells, variable subsets of autism cases showed altered methylation at hundreds of loci, with significant overrepresentation of disease-associated genes, suggesting an overlap between the genetic and epigenetic risk architectures of autism.